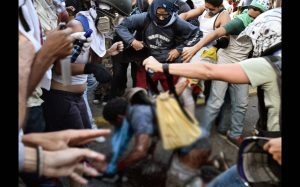 Fresh Venezuela clashes after man burned alive – Royal Times of Nigeria. Doctors rallied in Venezuela on Monday in the latest street protests against the government of President Nicolas Maduro, as a young man lay in hospital after being set on fire by an angry crowd. The death toll climbed to 48 over the weekend, with hundreds injured and thousands detained, as the unrest entered its eighth week, according to authorities and rights groups. In the latest gruesome unrest on Sunday, a man was beaten, doused in petrol and set alight during a protest in the capital Caracas, an eyewitness video and photographs showed. The crowd parted as he ran away in flames. Some reports said the man was accused of being a thief but the government alleged he was attacked for being a Maduro supporter. Speaking later on television, the president identified the man as Orlando Figuera, 21. He said he was hospitalized with first- and second-degree burns over half of his body and six knife wounds. The opposition is marching in daily protests demanding elections to remove Maduro from power. They blame him for an economic crisis that has caused shortages of food, medicine and basic supplies. Maduro accuses the opposition of plotting a coup against him with US backing. He says the crisis is a capitalist conspiracy. More than 200,000 protesters rallied overall on Saturday in Caracas and the western city of San Cristobal, according to estimates by the opposition and AFP reporters. Police fired tear gas to break up the demonstration and protesters responded by throwing rocks and Molotov cocktails, in scenes now familiar after weeks of unrest. Fresh clashes broke out between protesters and police on Monday morning on the outskirts of Caracas, where demonstrators blocked streets with barricades. After marches by various civil groups, it was the turn of the Venezuelan Medical Federation to vent its frustrations in the streets. “We have barely three percent of the supplies we need,” said Douglas Leon Natera, president of the federation.